Happy Holidays: EHAG and The Spring Window. I won't have a piece ready for this months EHAG Emporium. I have been very busy cleaning the studio and doing display work and consultations at the shopping centre. 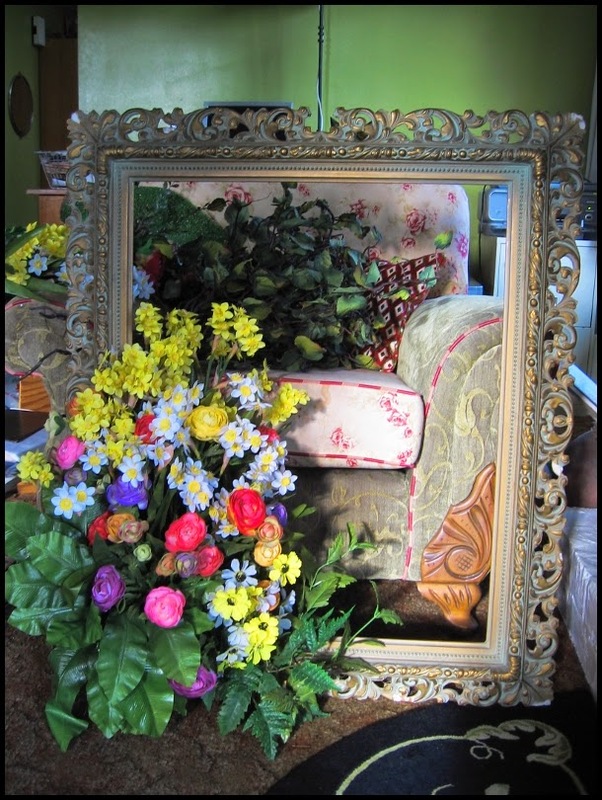 I am getting the props together for a new Spring window. 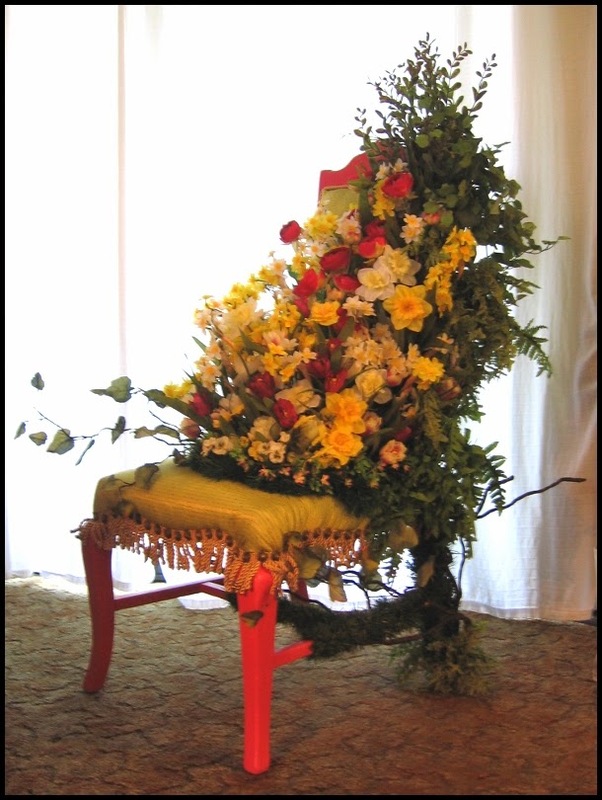 The large window that had the Christmas display will have a ornate chair, frame, and column in an outdoor setting that are being consumed by the Spring garden. 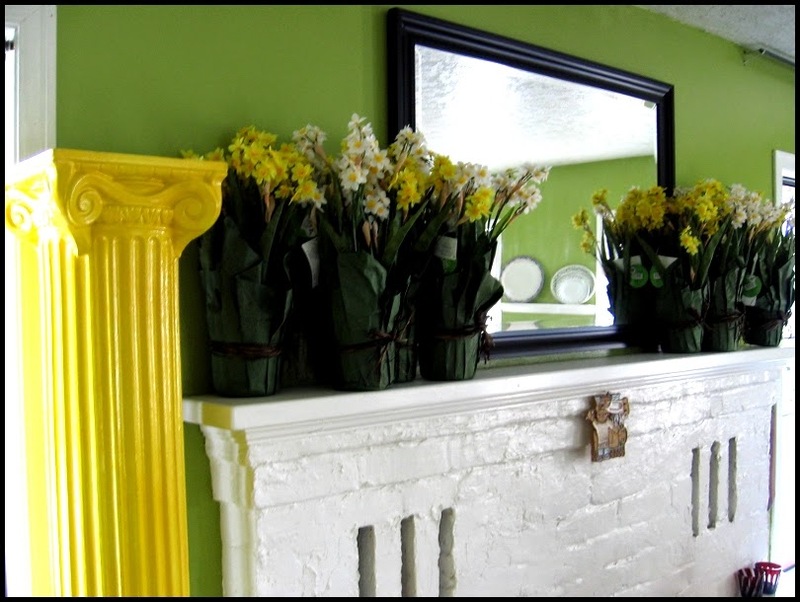 I am constantly on the look out for inexpensive but good quality and good looking faux flowers. Faux flowers can be very expensive and unfortunately there are no florist wholesalers on the island any more. 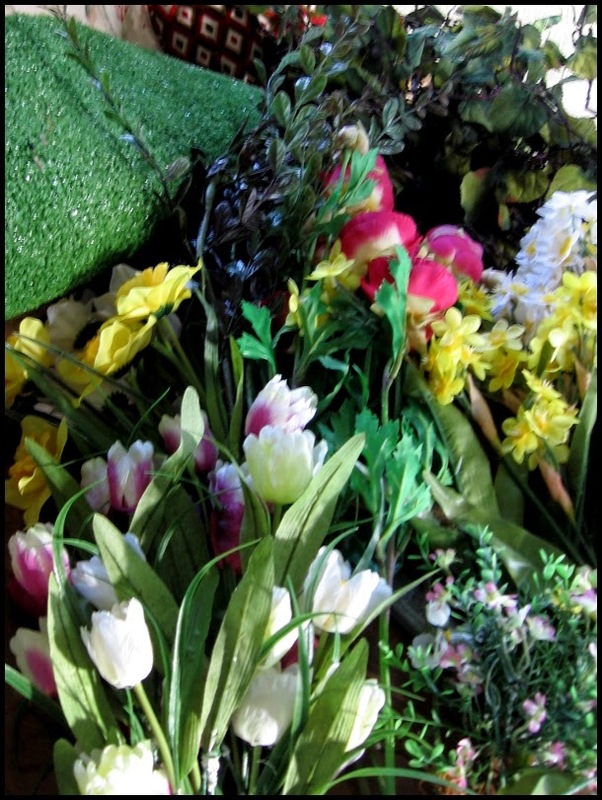 Buying wholesale can still be prohibitive if you are on a limited budget but need a large number of flowers. I like to buy at thrift stores and any place that has a deep discount. Most of these flowers were bought at Superstore. They must have been last years flowers that did not sell but I bought a huge whack of them. I picked up this chair from the side of the road about 6 months ago. It looked sort of interesting and the fabric that was on it has been taken off and washed to be used later on another project. I was going to send it off to Salvation Army but realized I could use it in the Spring window. After stripping the chair down to the frame I nailed a thin sheet of pressed wood to the bottom of the seat and the back of the chair. Florist foam for dried flowers is held in place against the wood with wire mesh. 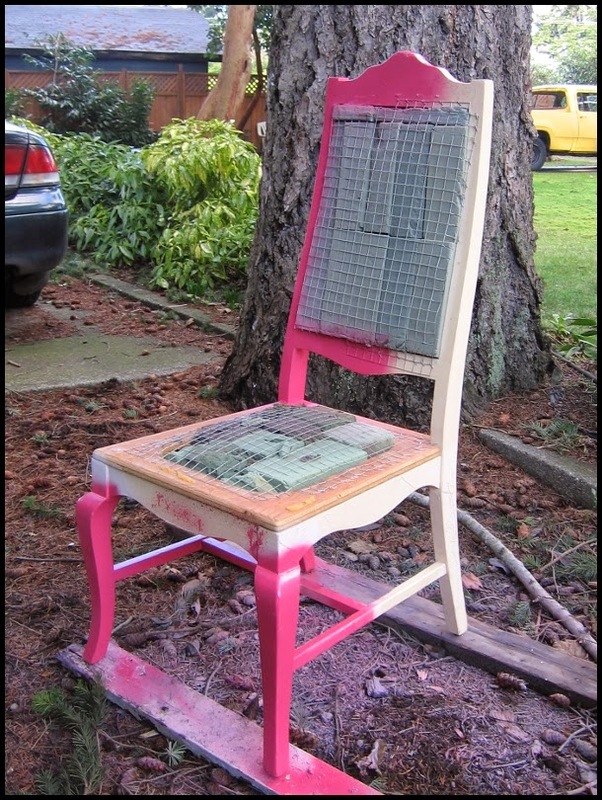 The chair has been spray painted watermelon pink and left unpainted where the flowers and upholstery will going. I am working in the living-room at the moment because the area that I was working in at the shopping centre is now occupied. The yellow column will be used in the window. 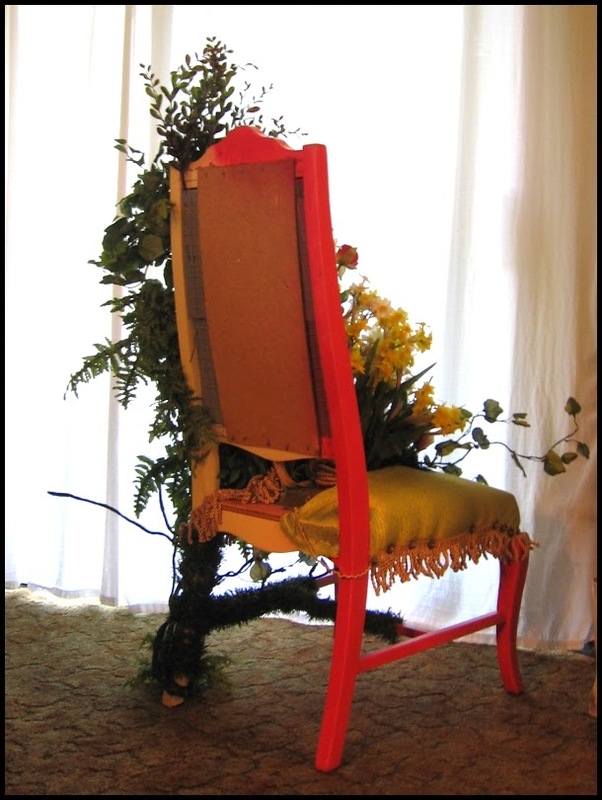 I am using bright colours for the column and the chair as a counterpoint to the realistic looking flowers. Those pots of narcissus are some of the flowers that I bought at the Superstore. They cost $2.44 each, an amazing buy for the number of stems in each pot. This picture frame I bought for $25.00 at Jacklin Trading Post. It was damaged and didn't sell but I like it's Rough Lux qualities. 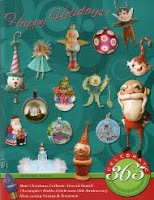 Originally it was to be used in the Christmas window but it didn't work. Except for the narcissus at the top of the group of flowers almost everything else I picked up at Salvation Army. It is raining and overcast here so the colours in the photo are rather dark but it gives you an idea of what the chair looks like. I dislike flash as it tends to flatten everything. Just so that you don't get all mushy and romantic about the chair this is what you don't see! It certainly looks trashy doesn't it? I will post pictures of the finished window sometime next week. I agree! If you give another sneak peek don't make it any easier! HAHAHA!!! !